Now, for her third pregnancy, she was at this rural health clinic outside Freetown, the capital. The Sierra Leone government has eliminated fees for pregnant women and children, and Ms. Kamara, like thousands of women in a country where surgery has been performed by the light of cellphones and flashlights, could afford trained medical staff to oversee her pregnancy for the first time. At the Waterloo Community Health Center here, the women were spilling out the door, as they have consistently since the fees were lifted last year. Sierra Leone is at the vanguard of a revolution — heavily subsidized for now by international donor — that appears to be substantially lessening health dangers here in one of the riskiest countries in the world for pregnant women and small children. In Sierra Leone, though, it seems clear that lives are being saved, providing an early and concrete lesson about the impact of making health care free for the very poor and vulnerable. By waiving the requirement for payments — which sometimes amount to hundreds of dollars and clearly represent the main barrier to using health facilities — the government here appears to have sharply cut into mortality rates for pregnant women and deaths from malaria for small children. The results in Sierra Leone have been “nothing short of spectacular,” said Robert Yates, a senior health economist in Britain’s Department for International Development, which is paying for almost 40 percent of the $35 million program, with most of the rest coming from donors like the World Bank. 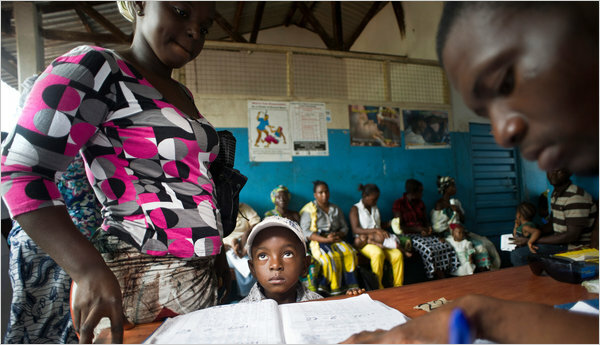 Since waiving the fees, Sierra Leone has seen a 214 percent increase in the number of children under 5 getting care at health facilities, a 61 percent decrease in mortality rates in difficult pregnancy cases at health clinics, and an 85 percent drop in the malaria fatality rate for children treated in hospitals, according to figures Mr. Yates supplied. But donors will not finance the program forever, and the hope is that revenues from the mining of diamonds and minerals, shaky for now, will replace them. Beyond that, Unicef recently discovered that drugs equivalent in value to 14 percent of what it had donated were missing. The agency has demanded an investigation. Given how recent, untested and strained some of the efforts to provide free health care are, some researchers are reluctant to make an automatic correlation between better access and better health. The outcomes are “not very straightforward,” said Sophie Witter, a senior research fellow at the University of Aberdeen, in Scotland, who has studied the elimination of fees in Africa. Lucy Gilson, a professor of Health Policy and Systems at the University of Cape Town, agreed: “I wouldn’t be prepared to say specifically it’s had x or y in terms of health outcomes.” But Sierra Leone, still scarred by a brutal decade-long civil war — men whose limbs were chopped off by rebels play soccer, using their prosthetic ones on a beach in the capital — hovered at or near the bottom in maternal and infant mortality tables. It had nowhere to go but up, which may be why there appears to have been an immediate benefit from the lifting of fees. The nihilistic rebels of the Revolutionary United Front deliberately took aim at health care facilities, as symbols of government authority. “This was about stopping it from being the worst place in the world,” said Dominic O’Neill, a British official who until recently headed the Department for International Development’s office in Sierra Leone. “It’s an emergency response to what was a humanitarian crisis. It was about stopping people dying.” Although the worn-out community health officer here in Waterloo, Jimmy Jajua, complained that demand was so high he had “no time to go off duty,” he noted that maternal deaths had dropped “drastically” now that his rudimentary clinic, still without electricity, charged no fees. Women at the clinics said they felt safer, having traded risky home births for at least some medical care. On a recent morning at Freetown’s main maternity hospital, about 80 women crowded into the prenatal examination waiting room, filling benches that doctors said had been sparsely populated in the past. Most of the women raised their hands when a nurse asked how many had been able to come to the hospital simply because the fees had been eliminated. The mood was upbeat. In unison they sang, “We are the pregnant women, and we are saying good morning.” Up in the spartan wards of the 1920s hospital, with its whitewashed walls and rolling metal-frame cots, there was little nostalgia for home births. “They don’t take proper care of you at home,” said Fatamatou Touray, 39, who had previously lost three children. In some countries, health care for women is already improving and being given more attention. I'm not sure how it's like in Sierra Leone, but the government there should definitely take notes.